Varsity Twin Post Bed - White Both you and your child will love the Varsity twin post bed. 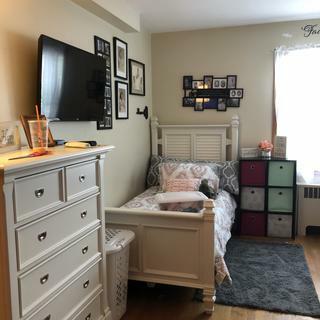 Its louvered panel headboard, turned square finials and feet, and crisp white finish add undisputed style to any bedroom. Plus, reinforced hardwoods create a sturdy foundation that can handle even the most energetic child. Both you and your child will love the Varsity twin post bed. Its louvered panel headboard, turned square finials and feet, and crisp white finish add undisputed style to any bedroom. Plus, reinforced hardwoods create a sturdy foundation that can handle even the most energetic child. The beds are beautiful and will be a good fit for a guest room. The quality is excellent. This bed is very good quality. I purchased two of them and they look great! Goes well in any bedroom and would match any decor. BEST ANSWER: Yes. A box spring is required for the Varsity Twin Post Bed. What is the height of the footboard? BEST ANSWER: The Varsity Kids Twin Post Bed Footboard is 33" high. Is furniture made in USA? BEST ANSWER: The Varsity Twin Post Bed is not made in the USA. can I just buy the headboard for a single bed? BEST ANSWER: The Varsity Bed headboard is available for individual purchase. For assistance, please contact 866-383-4484, option 3.